A sturdy box with a delightful 30-piece jigsaw and Snow White and the Seven Dwarfs picture book beautifully illustrated by John Joven. 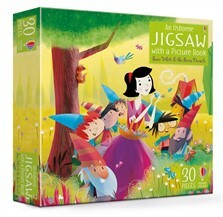 Little children can talk about the story as they do the jigsaw and the book and puzzle set makes a lovely gift. The large jigsaw pieces are suitable for little hands, and the completed puzzle measures 35 x 35cm.